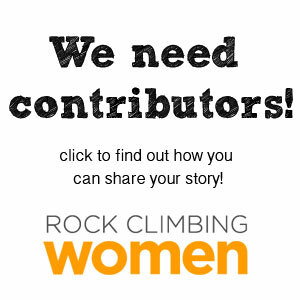 Want to contribute to Rock Climbing Women? In October and November, we’re looking for stories about the people you surround yourself with when you climb. Tell us about the new best friend you made at the crag or the furry friend who cheers you on from the bottom. We want to know what it was like to introduce your kids to your passion. Whoever it is, they’re part of your climbing experience. At RCW, we love climbing because it’s active and fun, it gets us outside in beautiful places, and it provides ample opportunity to spend time with other people. From my personal experience, whether strangers or partners, the people I climb with are some of my strongest memories. I love the connections we make when we’re outside in remote places. To submit to the blog, just click over to our contributors page. We’re always looking for new contributors, so send us your idea and we’ll get the ball rolling. We look forward to hearing your stories!